High acoustic vibrations are present at the outlet of screw-type compressors. These vibrations induce high acoustic levels into the connected components. 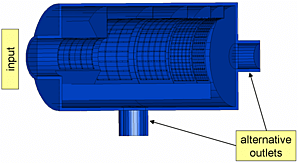 A muffler should be developed, which suppresses the acoustic vibrations for these components. For this purpose different types of mufflers have been analyzed. The minimum pipe diameter is given by the flow conditions and the design envelope is limited by the neighboring components. Therefore, a simple muffler could at most reach a transmission damping of 14 [dB] shown in the top figure. 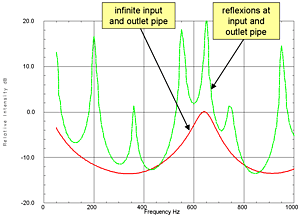 Acoustic reflections at the input and outlet pipe can lead to additional resonance magnifications. The frequency spectrum of the acoustic vibrations of compressors contains only a few discrete frequencies. According to a maximum utilization of the design envelope, Helmholtz-resonators are most appropriate for acoustic noise suppression. The center figure shows the transmission loss for different numbers of resonators. Using a single resonator, only the immediate vicinity of the resonance frequency is affected. 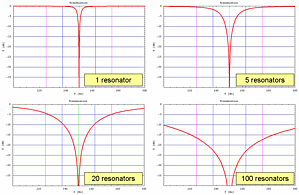 The resonance width increases by increasing the number of resonators.